Among the messages brewers try to hammer home, the one you probably see and hear more than any other is that of “Fresh is best.” Sure, it’s not the case with all beers; many darker, higher ABV or sour beers develop over time, variously mellowing, improving or gaining complexity. On the other hand, hop driven beers, such as pale ales, IPAs and lagers, should be drunk as fresh as possible to ensure the drinker enjoys them in their best possible condition – straight from a serving tank in an ideal world. Perhaps best known in the local craft beer scene for the fresh beer mantra is Feral and its bi-annual Tusk Day, upon which the WA brewery kegs its now 11.8 percent ABV imperial IPA and sends it as quickly as possible, refrigerated, to venues who are under instructions to tap theirs instantly. Taking up the gauntlet this week were Jason Harris and Craig Basford, the founders of Adelaide’s Big Shed Brewing Concern, who believe that, even as little as seven days after leaving the brewery, beer can no longer be classified as "brewery fresh”. Which is why they have just completed an epic 1,400km adventure across state lines, all in the pursuit of hoppiness. The journey, aptly named "Fresh As F*ck", involved a midnight start and a very fast road trip (all while obeying the law, of course) into Blues territory; a Cannonball Run of sorts, albeit with less buxom women in Lamborghinis and rather more facial hair and servo sunnies. The adventure was the culmination of the "Fresh as Phuck" event that was held at Sydney bar Bitter Phew throughout May, where pouring beers as fresh as possible was the name of the game. 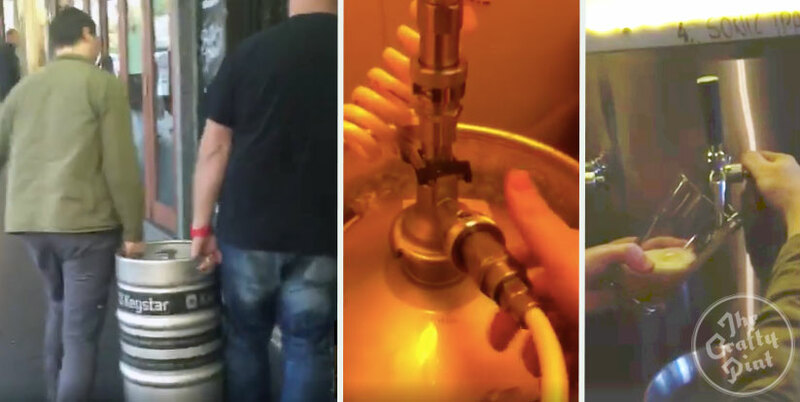 For obvious reasons, it was predominantly Sydney brewing companies taking part, as bar owner Aaron Edwards wanted to tap these hoppy drops within two days of them leaving the brewery. However, after Jason and Craig’s Sydney distributor mentioned the idea to them and told them they would most likely not be able to participate due to location, their egos – and love of a bit of mischief – took over and they accepted the challenge. 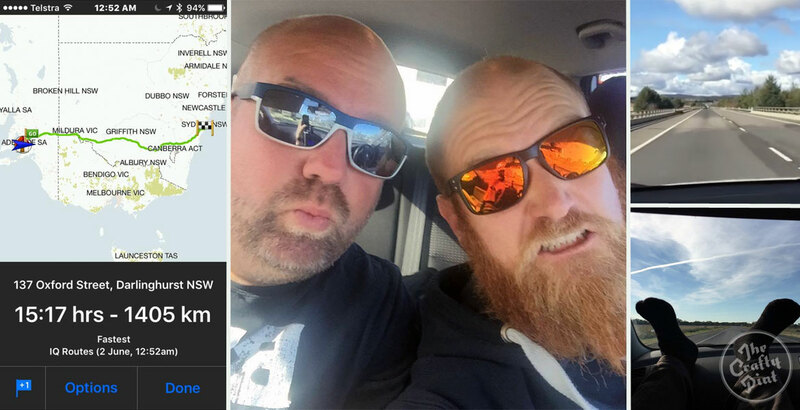 His trek started at midnight at Big Shed's Royal Park brewery, where the fearless duo filled one of their kegs full of their hop driven West Coast IPA, the Californicator. The keg was thrown in the car (wrapped in ice, of course, in a spot of DIY refrigerated transport) and they departed the car park 40 minutes later. After two hours, they had cruised past Peake and by the three hour mark they had crossed the border into Victoria. There were a few check ins at pubs along the way, including those in Murrayville, Underbool and Balranald but no beer was consumed; after all, like a lupulin-obsessed version of the Elwood brothers, they were on a mission from hops. The gents were in high spirits for the entire trip and apparently passed the time by “telling each other fart and poo jokes,” according to Craig, who went on to say that they also “discussed the philosophy of the Middle East” to maintain balance. The intrepid duo arrive in Oxford Street, the beer is lugged upstairs, hooked up, and the first beer pours. The only stops were food, caffeine and fashion related: they ended the trip with some stylish new (truck stop edition) sunglasses. By the 11 hour mark, things were still fairly relaxed in the car as they had now hit the freeway, which, according to Jason, “made life a lot easier.” The keg was still sitting in the back, fresh as, and still on ice. After one final pit stop on the outskirts of Sydney and a slight delay caused by a fight with Sydney’s peak hour traffic, their precious cargo arrived at Bitter Phew just 15 hours and nine minutes after the keg was filled. Jason and Aaron hoisted the keg up the stairs and hooked it straight onto a tap where thirsty punters were waiting and welcomed them with applause. For all the fun and games along the way, it’s a sign of just how seriously Jason and Craig take freshness in their beer. Their adventures can be relived through the Big Shed Facebook page, where videos were posted throughout the whole tour. With the challenge successfully completed – and the bar raised when it comes to hammering home the “Fresh is best” message – they’ve said they're happy to accept further challenges. All in the pursuit of hoppiness, of course.